I get asked this a lot by actors who’ve come in to shoot a self-tape. And it touches on what I’ve come to consider to be a real drain on the chances for the audition to be successful, i.e., too much worrying about being off book, or appearing to be off book. First, most invitations to submit a video audition come only a day or two ahead of the deadline. If you spend that precious little time mostly worried about being off book you are doing yourself a tremendous disservice. Yes, casting will notice and appreciate that you are off book, if you are. But no, they don’t give you demerits if you’re not. Casting understands that it can be very difficult to memorize the scene on such short notice. What they really want to see is whether you understand the character, not whether you are holding the sides. What you should spend your time on is exploring the scene and the character as much as possible. And guess what? If you really dig into what’s going on in the scene and what the character wants in it, you will, without trying, free yourself from the script quite a bit. If you aren’t 100% off book by the time the camera is rolling, do not be worried about using the script, or whether it is in the frame. Many actors spend so much energy trying to appear off book they end up stunting their portrayal of the character. It is far better to freely refer to the sides and be in the flow of the scene than to be mentally reaching for the lines. The proverbial deer in the headlights image is often the result of an actor who's struggling to come up with the lines. The actors who impress me the most are the ones who somehow incorporate the script into the scene and refer to it as organically as possible. For roles such as doctors, nurses, attorneys, anyone who might be consulting their notes, this is really easy. But even for roles where there is no obvious way to make looking at the script appear natural, the actor who can fluidly use those pages as if they were part of the scene nails the audition. Obviously you don’t want to be script-ridden, unable to deliver any of the lines without taking them from the page. So when the script is really cold, whether you’re taping the audition or in the room, my advice is to make sure the first and last lines get most of what memorization attention you can spend on it, because you want to start and end strong. Clearly, the best case is to be completely off book and not panicky about what your next line is. But the second best case is to deliver an audition in which casting can see your choices, even if they can see your script. This article also appears on the BackStage Experts website, which can be found here. 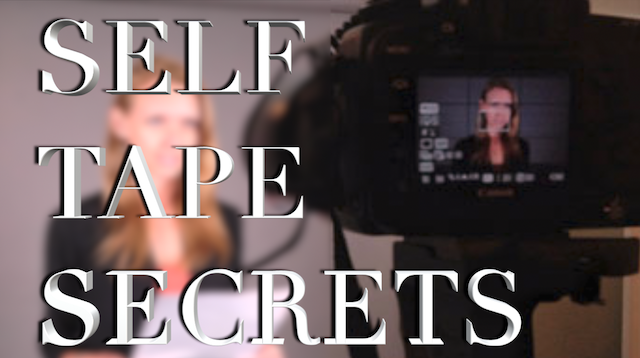 SELF TAPE SECRETS is written and distributed by Brad Holbrook, CEO of Actors Insite LLC and ActorIntro.com. All rights reserved.